Alyssa Faith Ericson is co-founder of both Kentucky Hempsters and United Hemp Industries. She talked with Tom Martin about the move to revive hemp farming and hemp production in Kentucky. Another industrial hemp season is off and running in Kentucky. Hemp production is expected to grow by leaps and bounds this year. 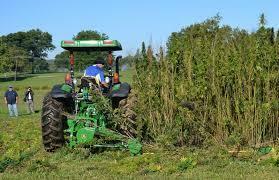 The State Agriculture Committee heard an update last week on Kentucky's hemp pilot project. In September, researchers at the University of Kentucky harvested the first legal crop in decades. UK Plant Sciences Professor David Williams says there's growing interest in a variety of hemp supported products. "They're particularly interested in the vast of the long strong fibers for composite materials like car door panels, pseudo plastics, particle board type products, building construction materials," said Williams.